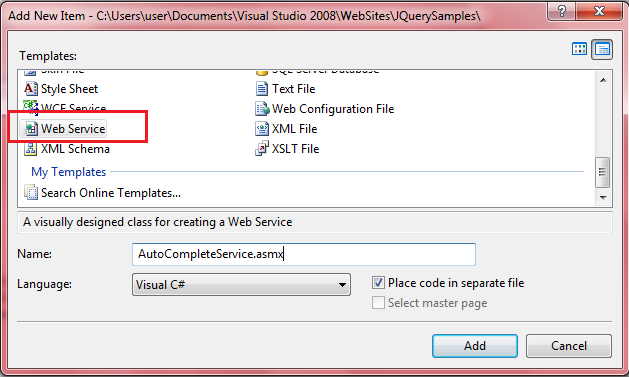 In this article I will explain how to get id or value of selected item from jquery autocomplete textbox using webservice in asp.net. In previous articles I explained AutoComplete with webservice, JQuery autocomplete textbox example, Ajax autocomplete extender example and many articles in JQuery using asp.net. In this article I will explain how to get id or values of selected item from jquery autocomplete textbox in asp.net. If you observe above code in header section I added some of script and css files by using those files we have a chance to display auto complete text with css style and I mentioned url field as “WebService.asmx/GetAutoCompleteData” this mean we are calling GetAutoCompleteData method from WebService.asmx webservice and select event which is used to get the userid of selected text value. Above code is worked for me. Please tell me how to store value in hidden field instead of label. instead of lable id you can mention your hidden field id it will work for you.. I just love your site!!!!! I was actually searching a lot for an autocomplete code in asp.net!!!!! Thanks once again & God bless u!!!! Very useful blog post, thanks! Thank you very much for your website in a clear way. It helps me a lot. sir, i want to get value of textbox in cs page. if i want to access the id of selected value in asp.net and how to redirect take that id on another page in asp.net . Very usefull article , but while selecting the name my ID is concanting with last selection. This is a great code.. Thanks a lot of sir.It's really helpful.But I can't run on local.I downloaded css and js files as your links and put in local server.But it didn't work.How can I solve for it?
" Write an API to upload product ( suppose a picture) on ebay? in C#"
i hv't written before, can u plz help me, i'll ever greatfull to u. How can i use the same code without using from jquery autocomplete textbox using webservice in asp.net. Can you please help me out on auto-complete functionality with database on dynamically generated textboxes with java script. I am pasting my code of dynamically generated textboxes. Please help on this. When the selections appear they aren't "holding". That is as soon as I move to select one it vanishes. The text box is in a modal popup, so is that causing the issue?